Taiyo Kikai Kogyo, Inc. was established in Kyoto in 1943. Since then, we have been developing and manufacturing various types of machinery with a main focus on gears. From product planning and heat treatment to finish, all the processes are consistently carried out in our factory alone, and both OEM and ODM are supported. We provide value-added products with the most advanced technology and creativity, and have gained favor with various clients. 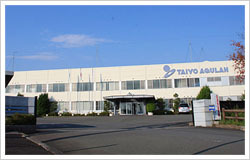 Copyright © TAIYO MACHINERY Co.,Ltd. All Rights Reserved.